Vera starts out slow. She's a hard sell is Vera Stanhope - tough, insecure, fearfully intelligent, and afraid of placing confidence in others. Joe Ashworth, the dishy sergeant to end all dishy sergeants (sorry, Hathaway), is, however, a patient man. He's prepared to wait, to chip away at her walls, to take her moods and temper. I think they're my favorite detective duo of all time. What I offer here are the impressions I jotted down after each episode - minireviews, if you like, and more of a rough diary than anything, but here they are. You can watch the first three seasons free here. Season 1, episode 1: Hidden Depths. The very first episode. So this is my second time watching it, and while the first time I found it rather dull, this time it was merely disorienting. Like in the first episode of Morse, the iconic stuff is mixed with odd character beats (remember Morse in that horrid leather jacket?). There’s nothing that egregious here - Blethyn knows exactly who she is, and there’s nothing unusual about her performance - but the chemistry between her and David Leon’s Joe Ashworth is still a little shaky. However, this isn’t really the focus of the story. Vera’s father has just died and Joe reluctantly scatters old man Stanhope’s ashes over the river. It's the beginning of a long character arc. Vera's father shaped every facet of who she is - that she moves into his home and begins to drive his car is quite a strong symbol. Meanwhile, the two police officers are investigating the death by drowning of Luke Armstrong. It seems like it may be a repeat occurrence, for Luke’s friend drowned some months earlier. The plot thickens when another woman is found dead, and it it all points to a group of four friends - four men with plenty of secrets among them. Overall, a decent start, but Vera’s a character that takes a while to get used to. Blethyn’s not interested in softening her rough edges up front. You have to stick with it to really begin understanding what makes her tick. Season 1, episode 2: Telling Tales. Unusually for an episode based on a book, there are several questionable plot developments. 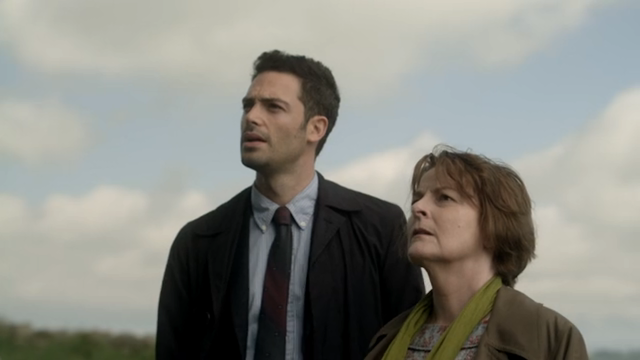 Vera solves the whole thing by noticing something which surely ought to have been obvious before and there’s just a bit too much suspicious activity going on, all in a small group of people (this isn’t Midsomer, pet). We get to see a bit more Vera-Joe bonding, though it’s cut short when Joe makes a funny comment about Vera’s father. Still, they’ve settled into a comfortable routine - they are more at ease with each other than they were in the first episode. Season 1, episode 3: The Crow Trap. Okay, I am officially in love with this series - the first two episodes were good, but this one really, really impressed me. The show has a variety of attractions. There’s the acting, which is, across the board, top-notch (it’s a British show after all.) There’s Brenda Blethyn as shabby, empathetic, tough Vera Stanhope. I love her frumpiness. I love her hat. I love her jeep. I love David Leon as her surprisingly down-to-earth sergeant. More than anything, the brooding, ethereal north is the star, framed by exquisite cinematography. By now, the characters of Vera and her team have been established quite well. Some change to the status quo can now be allowed. Grumpy Vera is less harsh in this episode. Calm Joe is stressed about his wife and kids. The story is about a woman - Bella - murdered in a remote hut. Soon, it becomes apparent that the motive was related to the dead woman’s opposition to selling her land to Godfrey Waugh, a businessman who wants to dig a quarry. Could Waugh have done it? He’s slimy enough. Then there’s Bella’s friend, a hippie who believes in redistribution of wealth. There’s a mother who thinks Bella abducted her son long ago. She blames Vera for not solving the case. There’s lots of regret here. Lots of broken family relationships. Like George Gently or A Touch of Frost or even Morse, this show does not leave us with happy endings, only glimpses of happiness, drawn from the ruins. This is a million miles away from the neatly done-up endings of Agatha Christie. The scripture monologue over the final scene reminded me of Broadchurch’s finale, and added a nice bit of religious gravitas. Season 1, episode 4: Little Lazarus. Vera is on her way home from the supermarket when she notices blue lights flashing by the side of the road. An officer has just discovered a woman, battered to death. After a bit of tutting over the young man, Vera notices that a child has fled the scene of the crime. She pursues, and manages to rescue him from a freezing river. The dead woman was the boy’s mother, it turns out, and she’s been on the run. Most of the story is spent trying to determine who she really was, where she came from, who was pursuing her. As it turns out, it was one sin, long ago, which snowballed into this tremendous mess of death and betrayal. At the center of this is silent, enigmatic Adam. Vera isn’t tremendously enthusiastic about that, since she doesn’t really know how to deal with kids. I suppose one could call this the Spielberg Episode: inevitably, if a lonely adult has issues relating to kids, they must be thrown together in a dangerous situation and learn to bond (Jurassic Park, anyone?) This is the case in Little Lazarus as well. The ending finds history repeating itself, and one wonders whether these old sins, too, will return to haunt the characters. Probably not, since they have the privilege of headlining the show. It's not as good as episode 3. One problem is that it’s not a whodunit, really. We meet suspects, but most of the time is spent tracking down the truth about Adam’s mother. The episode is also paced a bit more slowly, and the way in which the “peacocks” are found is contrived, brought about through an out of character moment from efficient Joe. Speaking of Joe, I didn’t quite believe his argument with Vera. It seems like her motivation was quite obvious, and Joe isn’t the defiant type unless he’s particularly upset. The season as a whole? A solid introduction to a good show. It has glorious scenery and cinematography, a fascinating partnership between Vera and Joe, good secondary cast in Kenny, Billy, and Holly - it's a shame it's so often overshadowed by other detective shows with more buzz - it's a glorious hidden gem. My review of season 2. Want something good to watch? Check out my full list of British detective shows. I came here to see your review of Vera Series 6, episode 1, that I saw last night. Should I wait? I just finished the final episode of season 4 yesterday, so hopefully I'll be able to get through season 5 and watch the new episode later this week. Will a review be upcoming? It just depends on how much I have to do this week. Finally caught up and posted a review. In hidden depths Vera intorduces a couple to Joe at the end....who are they?? Jack and Josephine? Her family maybe?